Marleny Aranda Saldaña (middle) with graduate students Yujia Zhao (left) and Carla Sofia Valdivieso Ramirez. 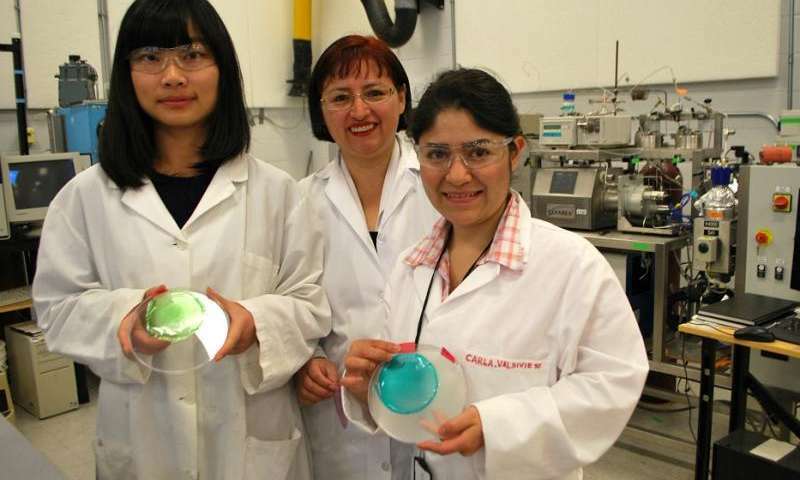 Saldaña and her research team developed a starch-based plastic film that has antioxidant and antimicrobial properties. With applications for both the food packaging and cosmetic industries, the new bioactive film is a green alternative to traditional petroleum-based plastics and possesses added advantages, said Marleny Aranda Saldaña, a process engineer and associate professor in the Department of Agricultural, Food & Nutritional Science who led the research team. "Development of antioxidant and antimicrobial bioactive films can improve product shelf life and safety," she said. "Potato peels have high phenolic content, a natural compound for plant protection, which you also find in apple peels and grape peels, among others." Saldaña and her team, which includes microbiologist and Canada Research Chair Michael Gänzle and cereal scientist Thava Vasanthan, used subcritical fluid technology to extract phenolic compounds from the potato biomass. Traditional methods use methanol, a toxic solvent. Subcritical fluid technology uses water above its boiling point and below its critical temperature, under pressure. In subcritical water medium, starch can be modified to influence the film's properties, such as its tensile strength, elongation, and antioxidant and antimicrobial activity. Saldaña's team has already obtained an international Patent Cooperation Treaty application for the processing method and TEC Edmonton is in the process of commercializing the process. Currently, the team is testing antimicrobial activity. The next step is to test the films on packaging of ready-to-eat meat. With international interest on whether the subcritical method would also work on cassava (the starchy root of a tropical tree), her team is also studying that possibility. Another researcher in Saldaña's lab is looking at adding nanoparticles on the films. Right now, there's a maximum amount of antioxidants/antimicrobials that the film can hold, but with nanoparticles, more could be added and released strategically. Meanwhile, Saldaña says, the overall goal is to achieve complete use of the available biomass. Her team, including visiting scientists from Brazil and China, also uses sub/supercritical water processing technology to obtain other value-added compounds and to gasify what's left of the biomass residue to obtain hydrogen. That research is ongoing.